I absolutely love Christmas time. I love the spirit of Christmas. The family time, the decorations, the music, the lights, the movies...even the snow is pretty. My Dad and I are the Christmas nuts in my family. 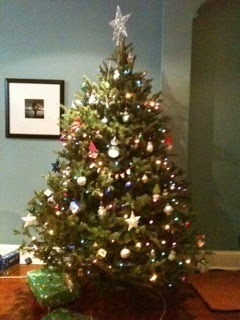 One of my fondest childhood memories was shopping for that perfect tree with my Dad. So, when Jenn and I went tree shopping last week, my Dad's voice was running through my head, "always look at the trunk...make sure it's straight." My Mom and I went to Vancouver this past weekend to visit my brother, Michael. We went into the lounge prior to our flight to grab some breakfast. I was hoping for something a little more substantial than the cereal that I had had for my first breakfast at 6am. I needed protein. My Mom pulls someone aside and says, "excuse me, my daughter is pregnant with twins, can she get some cheese perhaps?" The twin card, as we started calling it, had been pulled. On Friday morning, my Mom goes to grab herself a tea and brings me back a few small items. I need to eat right when I get up to ward off the nausea. She brings them back on this lovely tray. She tells me, "don't worry, I pulled the twin card with the girl upstairs!" While walking around Whistler village on Friday, my Mom sees a double stroller with young twins in it. "Oh look, twins!" She runs over to the couple. Michael and I keep walking, just a little bit quicker now. When she catches up with us she tells us, "don't worry, I didn't tell them you were having twins." This continued for the rest of the weekend. It became a big joke between us. I laugh as I write this. My Mom is awesome. She has always got my back. I love her so much and I love how excited she is for her first grandchildren. 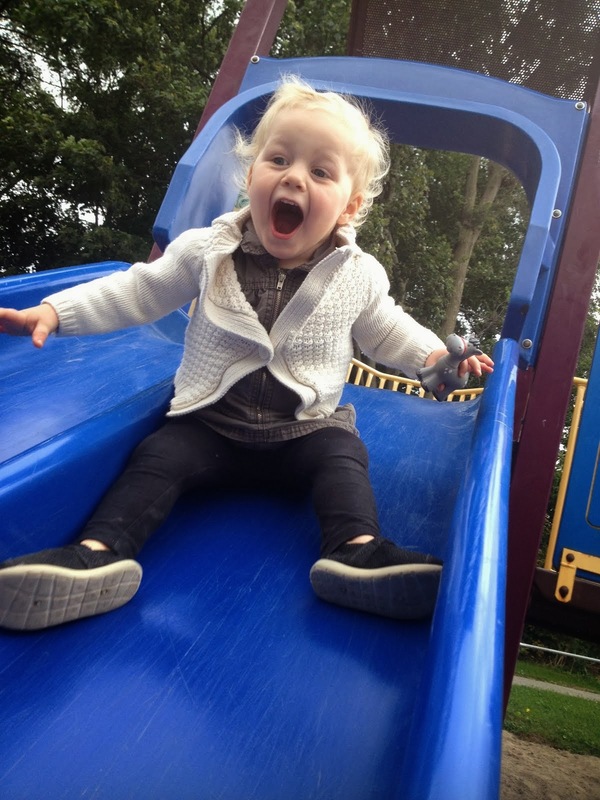 She'll have them on skates as soon as they're walking! The first trimester is coming to a close. It's gone so fast, yet so slowly. I remember seeing that positive pregnancy test exactly two months ago today. I'll never forget the shock that I felt! It seemed like the "apple seed" week (week 5) took a month to go by. Now, we're here...the end of the first trimester and onto the next. I'm hoping that the energy level picks up a little bit and the nausea simmers down. Right now though, I'm definitely on a high from seeing my little peaches (yes, this week's size) on the screen. 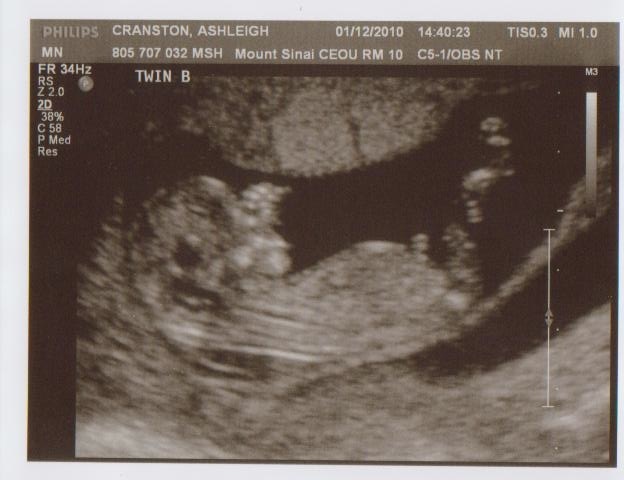 So yes, we went in for another ultrasound today. The babies were both looking great! Their heart beats were good and their sizes were spot on. We actually got to see their little hands and feet moving around. They looked like little astronauts bouncing around in space! The ultrasound took longer than it should have because the little devils were giving the tech a hard time. They weren't getting into the right position for certain measurements. As you can see (hopefully!) 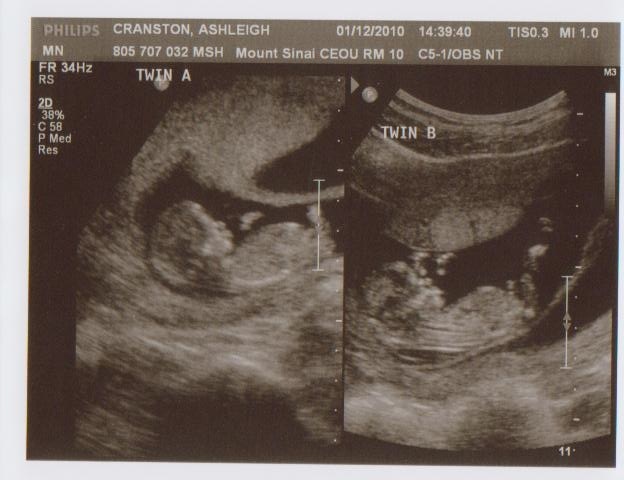 from the pics below, twin B's hands are waving and legs are stretched out. Twin A is curled up. We asked the tech to guess at their gender, even though we know that it's still too early. Her guess, you ask?! One of each!! 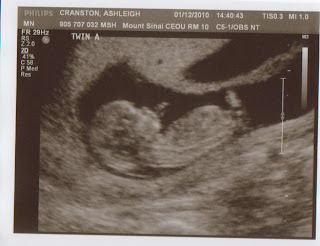 Twin A is the possible boy and twin B is the possible girl. We're not running out to buy the cliche blue and pink just yet though. The real determination will be at the 18 week ultrasound. 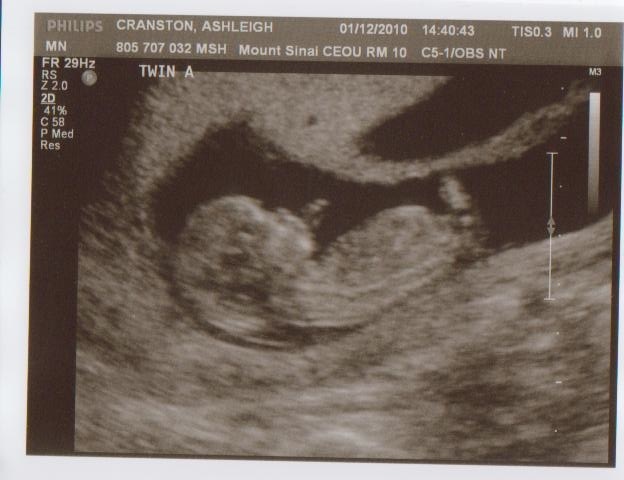 We've decided that after our 3 ultrasounds and the news we received today, we're going public with the news of our growing family. I know that everyone does it, but man it's challenging to keep this info a secret for 13 weeks! !